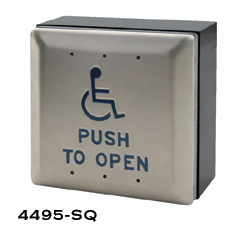 The 4-1/2" square push plate wall switch is attached to a 4-1/2" square surface mount box and can be utilized for both residential Power Access® 2300 and commercial Power Access® 4300 models. Push plate measures: 4-1/2" sq., Surface Mount Box measures: 4-1/2" x 4-1/2" x 2-1/4". Weather resistant box also available.